Our popular Maui luau show is ideal for smaller gatherings (recommended for parties of 75 guests or less). The entertainment begins with authentic Island music as guests arrive to your luau. Next, the distinct sound of the conch shell echoes signaling everyone to gather around for a journey through Paradise! Now sit back and be mesmerized as beautiful hula maidens tell stories of Hawaii and the South Pacific with their hands and hips. We offer an optional act, the spectacular and thrilling Samoan fire knife dance that will leave your guests breath taken. This package also includes audience participation for the men and women mixed with our trademark comedy that will leave them with lasting memories! This one hour show package is ideal for larger gatherings (recommended for parties of 75 to 100 guests). The entertainment begins with authentic Island music as guests arrive to your luau. Next, the distinct sound of the conch shell echoes signaling everyone to gather around for a journey through Paradise! Now sit back and be mesmerized as beautiful hula maidens tell stories of Hawaii and the South Pacific with their hands and hips. We highlight your show with the spectacular and thrilling Samoan fire knife dance, leaving your guests breath taken. This package also includes audience participation for the men and women mixed with our trademark comedy that will leave them with lasting memories! A complete revue fit for royalty, consists of three musicians, master of ceremony and seven dancers. The music sets the mood, while our Dancers meet and greet guests as they enter your very own tropical luau paradise. On key, your Paradise journey begins with the ceremonial blowing of the conch shell gathering your guests to a night of Paradise. Next, our lovely hula maidens delight your guests with various dances of the Polynesian Islands along with colorful array of costume changes. This package promotes audience participation which includes a staged Tongan drum lesson. As the drumbeat builds throughout the evening, the high point of your dream luau is the spectacular Samoan fire knife dance. Your guests will be amazed and you will be the star of this breathtaking choreographed event. 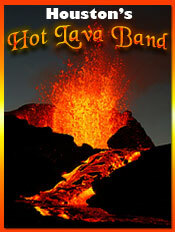 Houston’s “Hot Lava Band” will heat up any party! Our style of music ranges from old Hawaiian favorites to today’s modern beats. Examples of our “Style” include Reggae, Jawaiian, Paniolo (Hawaiian Country), Don Ho, Jimmy Buffet and many other Island favorites. We incorporate the following musical tools: Tahitian Ukulele, the Steel Guitar, Log Drums, Electric/Acoustic guitars and Standup Bass to provide our audience with a wide range and full sounding musical experience.In addition, we provide our clients with an optional three, four, or five piece setup of musicians to cater to your budget. Our performers are from the Polynesian and Galveston Islands, we use this background of experience to our advantage and it shows in our stage presence, local humor, and ability to interact with the crowd. Treat your guests to something hot and fresh as they dance and enjoy the music provided by Houston’s own Hot Lava Band!